All that’s happening at The Bombay Store! Two amazing months of the New Year have flew past us and here we begin the another. The festival of colours is knocking our doors & Women’s day isn’t too far either! We have some special plans to make your month awesomer & we therefore present to you our Triple bonanza. Let’s paint the town a little red, a little green and a little yellow! Yes, the festival of colours is here. Knowing how important it is to take care of your skin along with the celebrations, we present to you our range of Organic Colours. Shop our organic colour box that consists of 5 skin friendly colours. It is up for grabs both online and in-stores at a mere price of Rs.150/-. So make sure you celebrate Holi the ‘Organic’ way. Apart from this, you can also check out our range of Colourful Handbags, Pooja Thalis & Incense Sets, Women’s Jewelry, Holi Party Servewares like Trays, Mugs and Platters and personal care products. 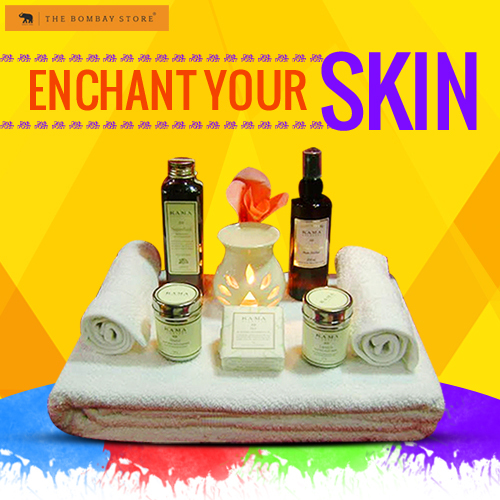 You can use our herbal range of shampoos, lotions, face wash & body wash to revive your skin post the Holi celebrations. 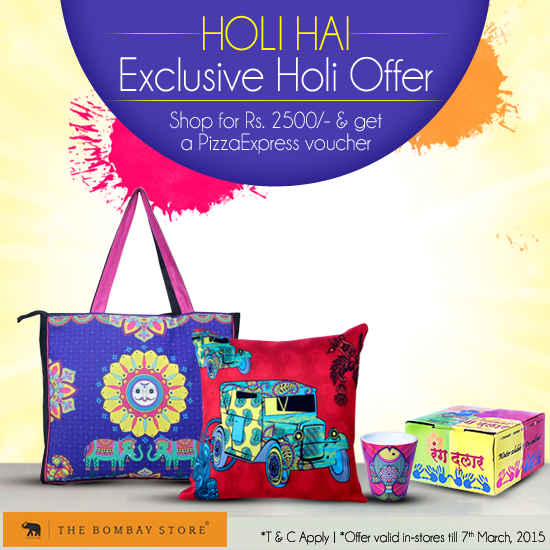 If Holi & Pizza are your favorites, you will fall in love with our Holi special offer. ‘Shop for Rs.2500 and get a Pizza Express voucher. This offer is valid till 7th March. 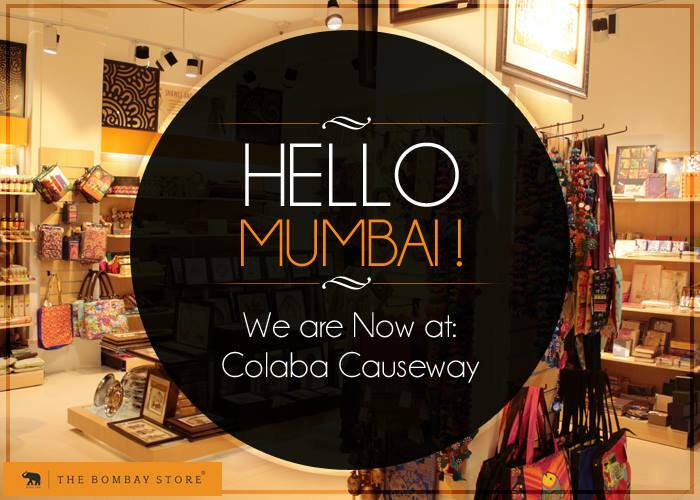 Yes, We’ve now hit a Six as The Bombay Store has now launched its 6th store in the heart of South Mumbai – Colaba Causeway. Do visit us soon as a new shopping destination is on the cards with some exciting offers for Holi & Women’s Day. 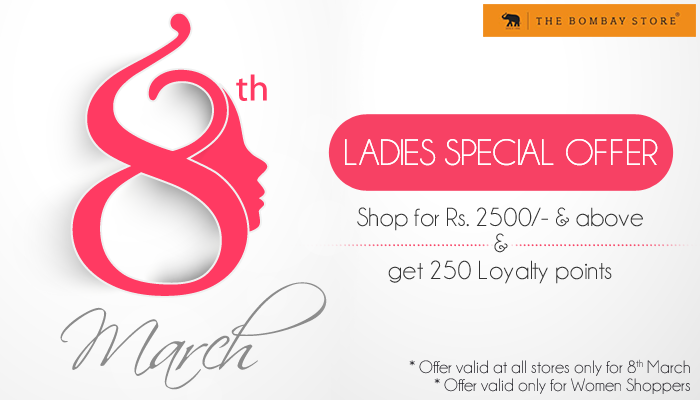 It’s the month of Celebrating Women & so we have got you some amazing deals. 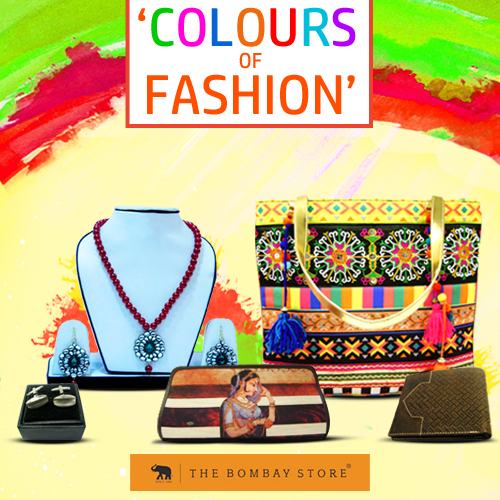 a) You can now visit http://www.thebombaystore.com for a Flat 15% off on all your favourite products. The offer is valid on all products except products from the Personal Care category. You are just a click away from shopping your heart out. b) The celebrations don’t end here, We also have a Ladies Special Offer under which you can shop for Rs.2500/- & above and get 250 loyalty points. 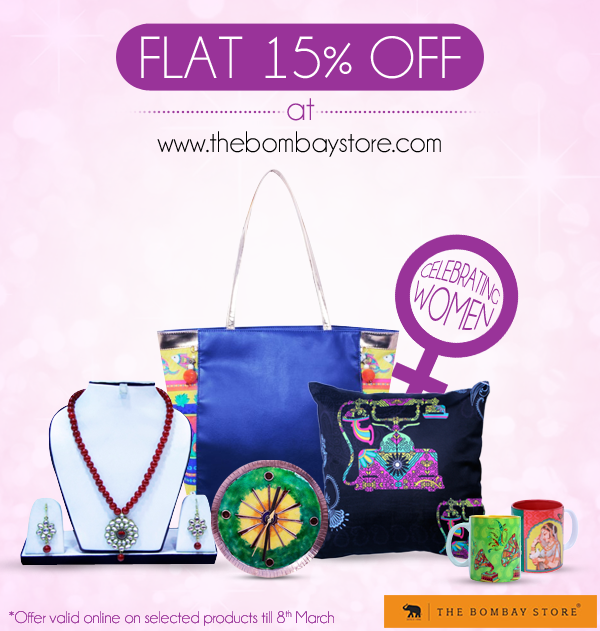 This offer is only available at The Bombay Store outlets on 8th March for Women Shoppers. Delighted by our Triple Bonanza ? Visit us now to make the most of it. 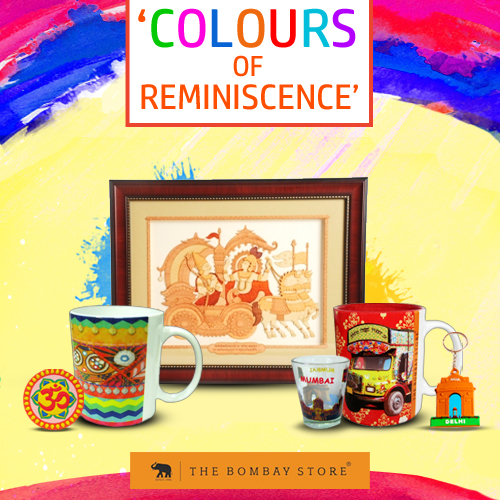 Wish to celebrate the festivity of colours like never before? We at The Bombay Store are just doing that. This Holi we are indulged in the celebration in a different style by showcasing the diverse ‘Colours of India’ at The Bombay Store! 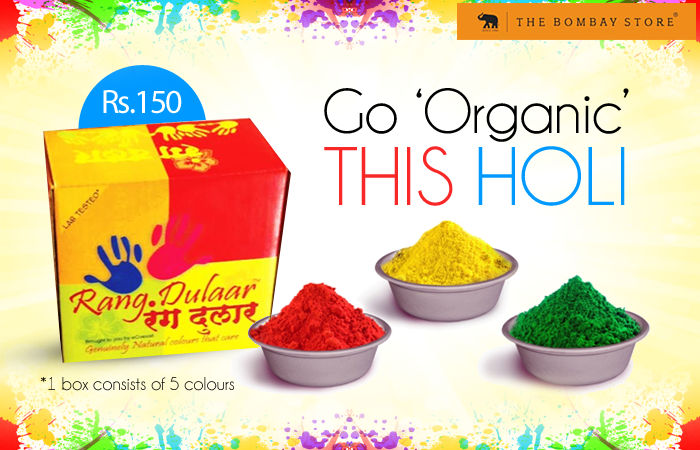 Not only this, we also present to you our range of Organic Colours “Rang Dulaar” to let you celebrate holi the skin-friendly way. Our ‘Holi Specials’ also include some must-haves for the occasion of Holi. 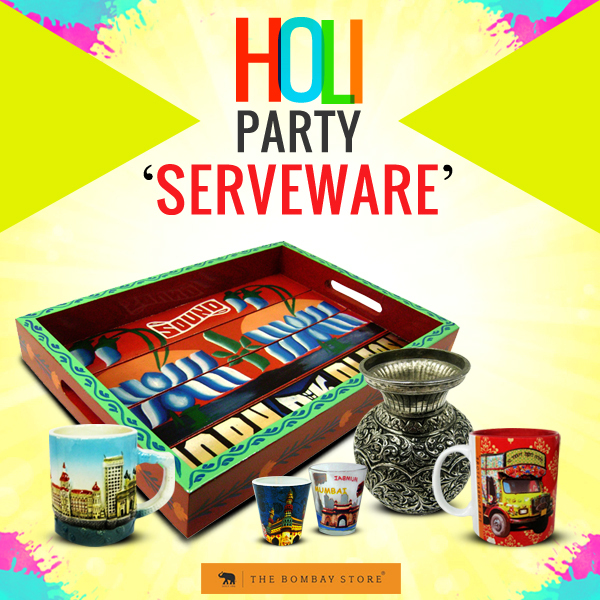 Jubilant Serveware that would Jazz up your Holi Party! Get our range of Wellness products that includes Body Wash, Shampoos, Khadi Soap, Facewash and undo the damage of colours to your hair and skin. Raise a toast to Bhaang in these quirky mugs because a Holi celebration is certainly incompletely without Bhaang! Make this Holi a special one! Wishing you a Holi coloured with joy, sprinkled with laughter and filled with warmth! We are about to embark upon the much awaited time of the year, the time of bringing colours into life – Holi! The harsh chemicals used in colours though can put a dampener on your spirits. But staying indoors on this festival of cheer is not a great idea either. So don’t keep yourself away from playing this fun and frolic festival. Instead, Go for organic colours this Holi. To make shopping of organic colours easier for you, we are stocking organic and water soluble colours “Rang Dulaar”online and in-store too. These colours are lab tested and are genuinely natural. The powdered colours are made from pure turmeric which is considered to be very good for the health of human skin. They are available in hues of Red, Pink, Yellow, Green and Blue. As all the colors are water soluble, they can also be used to make buckets of coloured water. One pack costs Rs.150 and consists of 5 colours each. Not only are we doing our bit to add to the joy of this festival with these Eco-friendly colours, but we are also launching a new range inspired by the vibrant colours of Holi – ‘Desi Hues’. Desi hues is a fusion of digital print with embroidery (rubari work). And to give this range a unique touch we have brought back tassels and pompoms. A celebration of this festival of colours, the range Desi Hues will be available across product categories which include bags, cushion covers and mugs ranging from Rs. 299 to Rs.1575. You can find this collection at The Bombay Store outlets at PM Road, High Street Phoenix, Inorbit Mall Vashi, Inorbit Mall Malad – Mumbai, MG Road, Market City Mall – Pune and 1 MG Mall – Bangalore. So, let the passionate reds, glowing greens, bold blues and other jubilant colours spread magic in your life. And don’t forget to go the skin-friendly way. Celebrate Holi in style with some ‘Desi Hues’.